The story of our evolutionary history played out over millions of years in Africa. Until recently, however, we have lacked any substantial evidence for a crucial period in this story, the beginnings of our genus, Homo. In 2015 the Ledi-Geraru Research Project announced the discovery of an early Homo jaw from the lower Awash Valley of Ethiopia dated to ~ 2.8 million years ago1,2. The discovery of this fossil led to even more questions about our origins. One of these centered on a long-standing hypothesis that global cooling and the spread of grassy environments set the stage for our origins3-5. Blue wildebeest (Connochaetes taurinus), plains zebra (Equus quagga) drink in an arid region of Kruger National Park, South Africa. Photo credit: Kaye E. Reed. 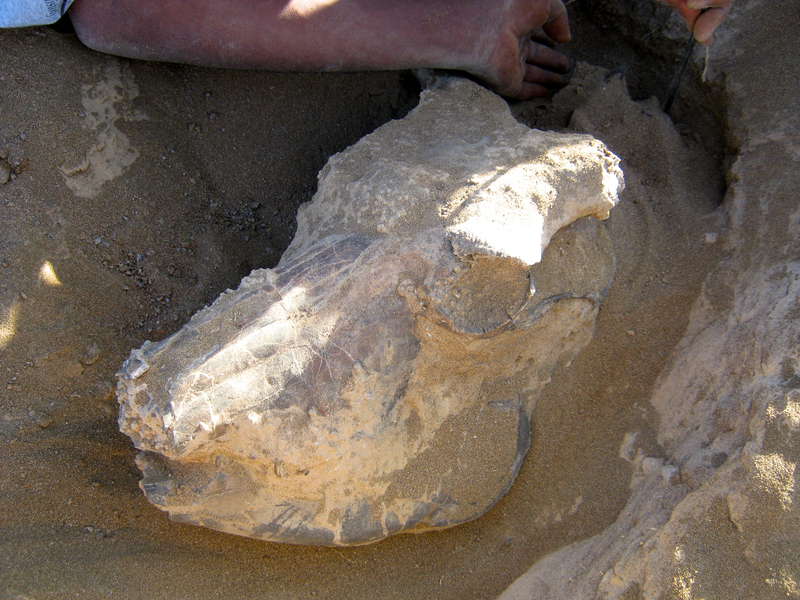 Hundreds of animal fossils have been recovered during field-work at Ledi-Geraru. Working with my colleagues John Rowan, Christopher Campisano, and Kaye Reed in the Institute of Human Origins at Arizona State University, and Jonathan Wynn at the University of South Florida, we used this record to further investigate the environmental context of our early Homo, particularly in relation to the spread of grassland environments. To do so we combined three sources of ecological data: stable isotope analysis of animal tooth enamel, stable isotope data from fossil soils (both which offer insight to what types of plants were on the landscape), and analysis of the herbivore and primate community. These data confirm that early Homo was found in an open and arid grassy environment. We show that almost all animals found with early Homo at Ledi-Geraru fed on grass, including some which previously consumed substantial amounts of tree leaves. This was an exciting find, but we needed to place these results in the broader geographical and evolutionary context of the transition from Australopithecus to Homo in East Africa. Stable isotope work in the Australopithecus-bearing Hadar Formation (~ 3.5-2.95 million years ago) of the lower Awash Valley indicated a grassy-woodland dominated by animals which included both grass and leaves in their diets6. Here we can document a significant shift in environment in the same geographic area only ~ 100,000 years later. In comparison with the stable isotope record from the Turkana Basin of Kenya7, the spread of grassy environments at Ledi-Geraru appears to have occurred ~ 500,000 years earlier than at Turkana. The fossil soil isotope record8,9, which indicates a spike in grassy environments in the lower Awash Valley earlier than in the Turkana Basin, supports these results. To supplement the stable isotope analysis we collected community trait data for East African herbivore and primate fossil collections between ~ 3.5 and ~ 1.0 million years ago. The community analysis allows us to compare the fossil communities to modern African communities based on variables such as the feeding and locomotor attributes of the animals. In this analysis, the Ledi-Geraru assemblages are characterized by drier and more seasonal environments than the previous Hadar Formation sites, and at an earlier time than sites in the Turkana Basin7,10. Surprisingly, this ecological change was not accompanied by a shift in diet for Homo. This only highlights the need for more data and more fossils to refine our understanding of environmental contexts and dietary behaviors during the origins of our genus. 1. DiMaggio, E. N. et al. Late Pliocene fossiliferous sedimentary record and the environmental context of early Homo from Afar, Ethiopia. Science 347, 1355-1359 (2015). 2. Villmoare, B. et al. Early Homo at 2.8 Ma from Ledi-Geraru, Afar, Ethiopia. Science 347, 1352-1355 (2015). 3. Vrba, E. S. Environment and evolution: alternative causes of the temporal distribution of evolutionary events. S. Afr. J. Sci. 81, 229-236 (1985). 4. DeMenocal, P. B. African climate change and faunal evolution during the Pliocene–Pleistocene. Earth Planet. Sci. Lett. 220, 3-24 (2004). 5. Bobe, R., Behrensmeyer, A. K. The expansion of grassland ecosystems in Africa in relation to mammalian evolution and the origin of the genus Homo. Palaeogeogr. Palaeoclimatol. Palaeoecol. 207, 399-420 (2004). 6. Wynn, J. G. et al. Diet of Australopithecus afarensis from the Pliocene Hadar formation, Ethiopia. Proc. Natl. Acad. Sci. 110, 10495-10500 (2013). 7. Cerling, T. E. et al. Dietary changes of large herbivores in the Turkana Basin, Kenya from 4 to 1 Ma. Proc. Natl. Acad. Sci.112, 11467-11472 (2015). 8. Levin, N. E. Environment and Climate of Early Human Evolution. Annu. Rev. Earth Planet. Sci. 43, 405-429 (2015). 9. Feakins, S. J. et al. Northeast African vegetation change over 12 my. Geology 41, 295-298 (2013). 10. Fortelius, M. et al. An ecometric analysis of the fossil mammal record of the Turkana Basin. Phil. Trans. R. Soc. B 371, 20150232 (2016). Thanks a lot for your very interesting work. It's a beautiful description of climatic changes in Plio-Pleistocene E.Africa. However, the possible relevance of E.African climatic shifts for australopithecine (from graciles to robusts?) or Homo's evolution is less clear. It's not certain whether H.erectus evolved from australopiths or habilis or had non-African ancestors. Some of the earliest H.erectus-like fossils have been found outside Africa (Dmanisi & possibly Mojokerto 1.8 Ma) and retro-viral data even suggest that human Pliocene ancestors might have lived outside Africa (e.g. Yohn cs 2005 PLoS Biol 3:1). Possibly H.erectus only about 1.8 Ma re-entered Africa, perhaps at a time when there were marine connections between the Indian Ocean & lake Turkana (appearance of stingrays at Turkana together with H.erectus 1.8 Ma, see Feibel 1993 Lethaia 26:359, Joordens cs 2009 JHE 57:656), google e.g. "unproven assumptions so-called aquatic ape hypothesis". Different lines of evidence suggest that erectus-like Homo dispersed intercontinentally, not running over African plains as commonly assumed, but following African & Eurasian coasts & rivers.